Details relating to the Finnish Commemorative of 2006. The coin commemorates the introduction in 1906 of universal suffrage in Finland – in other words extending the right to vote to women. Finland thus became the first European nation to extend the right to vote to women. In the inner circle we see the faces of a man and a woman separated by a wavy line. An interesting feature of the coin is that there is no clear top/bottom distinction. 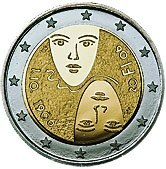 One can have the female face at the top and the male at the bottom or the other way around. With the female face at the top the inscription “1.10.1906” appears on the left of the inner circle and the inscription “20FI60” on the right. It is unusual to have the numerals of the mint year separated. A third unusual feature of the coin is that the mint mark appears twice – at ten and four o’clock -near the eyes of the two faces. So, all in all, an interesting coin packed with surprises. 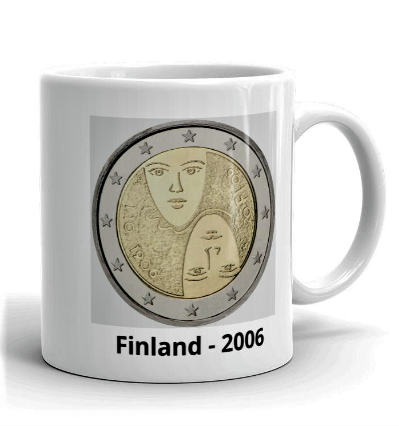 Return from Finnish Commemorative 2006 to euro coin collector. Click on the image to go to the store.